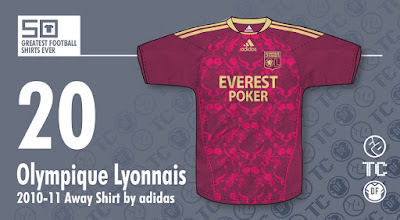 As with the previously mentioned Marseille shirt, this was from the period where adidas were providing French teams with what some regard as strikingly unique and extravagant designs and other, less educated/cultured folk regard as abominations. 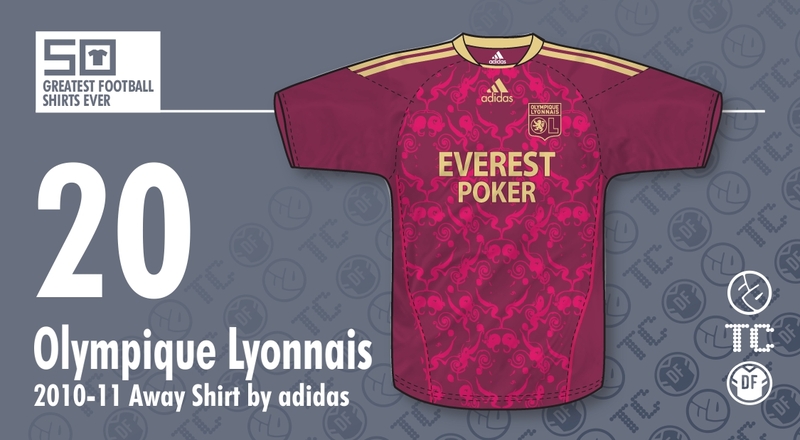 I am clearly in the former camp, hence this shirt's initial nomination and, due to the others on this project being of a similar ilk (though not cultured enough to appreciate the aforementioned Marseille shirt), subsequent inclusion in the chart. Flouncing in in a deep burgundy, the front is adorned with what appears to be a pattern inspired by a Las Vegas casino carpet and given all the trim is in gold, one could be forgiven for thinking the whole ensemble was conceived somewhere on the Strip. And this is where that difference of opinion come in. While some think the result is gaudy, tacky or just plain awful, I, and my esteemed colleagues, all deem this to be a masterpiece of design and style. The print is a triumph of gorgeously indulgent, swirling symmetricality (yeah I know the word is symmetry, but that doesn't sound half as good!) in a darker burgundy than the rest of the shirt. From a distance, it resembles a Rorschach ink blot test, which makes you wonder what the designer saw when he looked at his creation... Maybe his mother scolding him for not having a sensible job... and why isn't he wearing a coat, it's cold outside, you'll catch your death Martin!!!! Again, similarly to the Marseille shirt, the trim is all gold and while some say it jarred against the blue, here it just adds to the luxury feel (or the tackiness, if you're a berk). One final detail is something that only those who purchased a certain version of the replica shirt would have seen. The numbers on the back, as well as being available in boring old block fonts, were also available inset with the same pattern as on the front of the shirt, but in gold. Damn that's some good detailing right there!